When Hooria Mashhour, Yemen's minister for human rights, took the oath of office nearly one year ago, little did she know the job would bring personal as well as political hardships. In July this year, AlMotamar, the official online newspaper for Yemen's ruling party, the General People's Congress - still headed by the former president Ali Abdullah Saleh - published a news story with a provocative headline. "Minister Mashhour Calls for Freedom of Sexuality, Banning Polygamy and Cancellation of Quranic legislation", the headline read. The unnamed author explained that "the minister of human rights delivered a draft resolution to the cabinet consisting of multiple violations against Quranic legislations and mentioning a clause against the GCC deal that led to establishing the current cabinet which Hooria Mashhour is one of". The report claimed that Ms Mashhour supported women's and gay rights in Yemen in her draft resolution. The minister denied delivering such a draft resolution and said the points AlMotamar focused on were the standard recommendations that the United Nations High Commissioner for Human Rights always puts forward. Yemen, like most Islamic countries, has reservations about some of those recommendations, and Mrs Mashhour expressed those clearly. The minister described AlMotamar's article as part of a systematic campaign of incitement against her as a way to silence her work. She took to her official Twitter account and claimed the media of the General People's Congress "is inciting the community against me due to the ministry's efforts in following up with the Human Rights Council recommendations that condemn the immunity to killers of protesters during 2011 crackdown on protesters". Before the article was published, Mrs Mashhour had been pushing for an impartial national committee to investigate crimes and violations committed by the government during the crackdown on last year's uprising, which forced Mr Saleh from power. In addition, Mrs Mashhour was persistent in calling for the cancellation of the immunity granted to the ex-president. She repeatedly expressed those demands during Cabinet meetings. The GPC understandably has no wish to see the former president lose immunity or have his policies during the uprising investigated. Mrs Mashhour says she is in the process of filing a case against AlMotamar for spreading false information about her work and instigating the community against her. For its part, the news service denies her allegations. In an emailed statement to me, AlMotamar said it published the story "without bias or incitement". Mrs Mashhour "didn't deny that she proposed the draft resolution but she called it as the HCHR recommendations and she asked for each minister to presume accordingly. We assure that it wasn't our intention to target Mashhour for her person and we have no reason whatsoever to do so." Feminist activists in Yemen strongly believe that had it been a male minister the media war would have been different. In a conservative country like Yemen, to associate a person with a news story about gay rights is agitating and could lead to serious, perhaps fatal, consequences. Yet Mrs Mashhour remains firm. She wrote on her Twitter account: "I will never ever give up defending the human rights of all Yemenis, regardless of their cultural and/or political backgrounds." Mrs Basha is the founder and chair of Sisters' Arab Forum for Human Rights (SAF), an NGO watchdog that works on uncovering a wide range of human rights violations in Yemen. This woman has been subjected to verbal and physical harassment, especially after the publication in 2009 of a report on torture in Yemen. Nonetheless, she continues the fight. "Aren't you tired?" I asked her innocently in Stockholm. "It's been a risky job for you." She answered me with complete confidence and a firm voice. "Over the past 10 years, SAF has managed to file hundreds of suits in Yemen's courts about individuals violating human rights and women's rights. Justice was served for 70 per cent of them. How can I get tired? I'm very passionate about what I do and I have no plans whatsoever to stop." Mrs Mashhour and Mrs Basha are representative of many other female warriors who have been on the front line for several generations, fighting for a better future for all in Yemen. The fact that many outsiders only became aware of this during the 2011 protests, should not reflect on the female champions who continue to agitate for change. Arguably, there is no cohesive feminist movement in Yemen, but each woman in Yemen has been part of a historical collective women's movement that has been taking place for a long time. I can say that confidently, bearing in mind that Yemen used to be in its history a very feminist country. In fact, Yemen was ruled by three different queens. The best-known is the Queen of Sheba from ancient history, but in the 11th and 12th centuries the country was ruled by queens Arwa Al Sulayhi and later Asma'a Al Sulayhi. However, it's not enough to romanticise historical facts because, today, women in Yemen are suffering more than ever with Yemen's overall problems and, accordingly, they need empowerment more than ever. During the 2011 uprising, Yemeni women astonished the world with their role during the protests - especially, of course, the Nobel laureate Tawakkol Karman. However, their role in the uprising was just an extension of their everyday struggles. "Many people talk about Yemeni women breaking the wall of fear and social norms during the uprising," says the Yemeni journalist Samia Al Aghbari, "but no one mentioned how Yemeni women have always been and still are in the struggle for a better tomorrow for everyone in Yemen. That kind of discourse seems to me to marginalise the fact that women in Yemen have a long history in the struggle." Yemen currently has three female ministers in the cabinet of President Abdurabu Mansur Hadi - unlike Mr Saleh's where we had only one female minister. After the deal by the Gulf Cooperation Council for Mr Saleh to step down as president, there was huge pressure on the new president to assign female ministers to the new cabinet. Perhaps that was the only good thing out of the GCC deal. Having three female ministers puts Yemeni women in a relatively better political position than our sisters in, for instance, Saudi Arabia. In a nutshell, one can measure how healthy the social and political structure of a country is by measuring women's status - and women in Yemen still face a wide range of challenges, even after the revolution. Yet no matter the challenges they face, they stand firm. 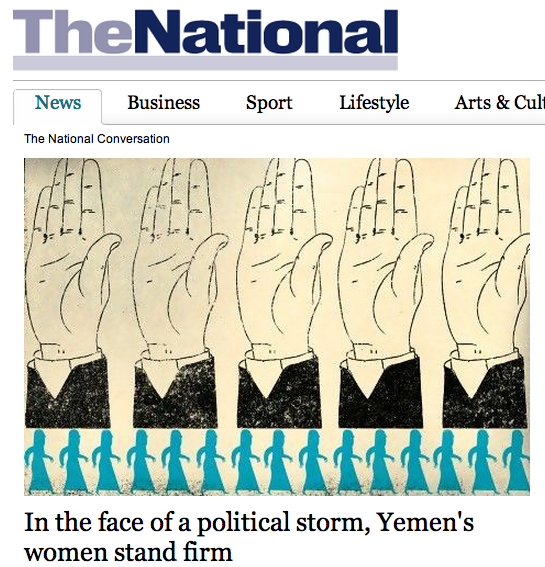 Even in the midst of the storm, Yemeni women keep fighting.